Train firm GNER has turned to Thunderbirds in an effort to improve the speed and reliability of East Coast Mainline services. The company has signed a contract with freight operator EWS for the hire of 125mph Thunderbird rescue locomotives. 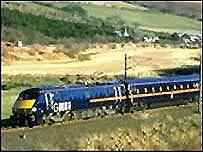 Four high speed diesel class 67 locomotives will replace older rescue locomotives used by GNER for recovery operations. They will respond to incidents where trains fail due to problems such as the loss of power from overhead lines. GNER says that the Thunderbird locomotives, being introduced over the summer timetable, have a greater acceleration and will provide a quicker response time to incidents. This in turn will reduce delays for passengers. The locomotives will be based at four strategic locations on the East Coast Mainline, including Newcastle and London Kings Cross. The new agreement follows the completion of GNER's £30m, three year programme to improve the reliability of all of the electric locomotives in its passenger fleet. Christopher Garnett, GNER chief executive, said: "Our trains are more reliable than ever, but it is vital that we have back-up to respond quickly if a train becomes unable to move under its own power. "Having a fleet of high-speed diesel locomotives, always on stand-by, cuts delays and helps us to maintain the quality of our service." Philip Mengel, chief executive of EWS, said: "EWS is delighted to be working with GNER to provide modern and reliable traction for these thunderbird locomotives." The contract the two companies have signed for the rescue locomotives runs until April 2005, the end of GNER's current franchise.